UPDATE # 1: The hack is now getting blocked by Experts-Exchange for Indian (and probably other non-english countries) visitors, to get around this limitation simply use a proxy solution. It worked, thank you dude. backdoor sign up free link unfound? please explain wheres link? isn't this the 7 day free trial version?! Another wonderful find from Megaleecher!, thank you and Happy Holidays! Thanks dude nice article. I was always frustrated to see this website coming up in my google searches and I'm unable to access it. Even I was thinking is there any way we can make google not to show the websites that we ban from our search results. So that we can ban the sites which are spams, useless, and irritable. You can. Get Firefox, then get the CustomizeGoogle extension. Voila! Hi , i can't able to see the answer. kindly help???????????? Just use the cache of Google to see what the Google bot did find. Best however to use newsgroups or the free www.bytes.com to get the same information/solutions. I've been an expert there for Access and started a blog to show their way of handling quality/service aware experts. EXPERTS-EXCHANGE FREE TRIAL OFFER. 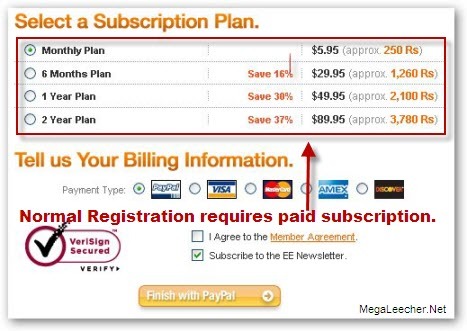 To take advantage of our FREE TRIAL OFFER, you need only take a few moments for the registration process. First, review and agree to our terms and conditions for membership; next select the type of program you are looking for; and finally, provide us with the necessary financial information for that program. Once that is done you are ready to started enjoying the rewarding world of EXPERTS-EXCHANGE. Our FREE TRIALS are limited in duration and of course only one (1) FREE TRIAL per customer. At the end of your FREE TRIAL if you are satisfied with our service and we are certain you will be, you need do nothing further. The financial information that you have provided for the FREE TRIAL OFFER enables us to continue your membership with EXPERTS-EXCHANGE for as long as you wish. You may cancel at any time. A valid credit card is required to take advantage of the FREE TRIAL OFFER. While your credit card will not be billed for the FREE TRIAL OFFER we will seek authorization from your credit card company to insure that your card is valid. We receive no money from this initial authorization transaction, even if your bank or credit card company temporarily holds the funds in your account. Once you have completed the FREE TRIAL OFFER and become a member of EXPERTS EXCHANGE, your credit card will only be billed for the specific plan that you have selected. If you cancel prior to the end of the FREE TRIAL period1, no charges will be incurred. " This is not TRIAL REGISTRATION. WoW MegaLeecher ppl, u are AMAZING!!! Its working thank u!!!!!!!!! Hey!! it works just fine. Click on the link "backdoor signup link" above and signup there. 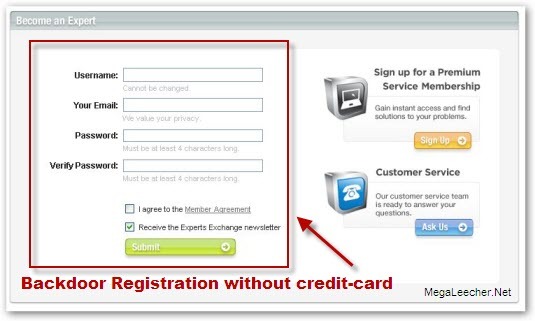 Once you signup, just refresh the same page on expert-exchange site where the question is posted OR login there with your new id and password. You will get the answer in the same box where you were previously asked to signup. This process basically instantiates an account based upon their allocation of so-called "Experts"; hence you are required to provide your expertise upon specific topics (i.e Answer Questions) in order to ascertain a Premium Membership which will allow you view the postings which are restricted to registered users, hence their Lame Cookie procedure and other alternatives utilized to block access to their solution is in actuality redundant. Um.. you people are all dumb? Have you ever just tried scrolling all the way to the bottom? Yeah. They put the "Join now!" all over the top, and leave the full content at the bottom of the page. Try it sometime. Very true. Just scroll to the bottom for the full content! Most of these restrictions can be overcome. You can use Google to search Experts-Exchange which returns better results than Experts-Exchange's own search function. And 90% of the time, your question has already been answered on Experts-Exchange or some other website, so if you spend an extra 10 minutes searching you will not need to ask a question. thanks a ton dude ! hey!! its working in India too just fine!! Just create a new account through "backdoor signup link" and login to expertexchange site thru ur new id. You will find the answer there. how to get the points...... when i asked some problem and how can i can gain more points?????????????????????? It worked great. It might be a trial though. superb backdoor...it did work ! thanx it worked! i got the url off of bugmenot.com. for people who don't know, go to bugmenot.com to get passwords for sites. go here for bugmenot thank-yous from people. I just tried it out myself. Just create a new account through "backdoor signup link" provided at the top here on megaleecher and signup with ur new id to expertexchange site and scroll down and find the answer in the same box where they asked you to signup. Thanks. Its work very fine. You are helping programmer to solver their problem. Thanx u very much dude.!!!!!!! DO NOT directly link to their site. do not directly link to their site. they will easily caught and will block the url and the users. you can use tinyurl or other redirection sites. EPIC! i was expecting a link to malware or a rickroll or something, seemed way too good to be true. Thanks it works from Phils! Does not work now in the US. Any ideas? Instead of stealing, sign up for limited membership, answer a few questions in your area/s of expertise, then you'll be a qualified expert and have full membership. If you can't be bothered doing that, pay the membership and stop being a bludger. This registration is for Expert only. and it not a secret page (just now). The account is for expert only. You still need to answer questions get some points to see answers. I have a valid login. But, whenever I try to login to the site, I get the message that "Enable Cookies". I have cleared all cookies and also everything is enabled. Still I am facing the same issues. When I send a mail to their help desk, it is getting bounced!! Anybody facing similar issues and have any solution to overcome this problem? its great! thanx its works! It is asking to answer the questions and earn points to upgrade the membership for viewing the answers. bakwas!! no use of this account.. it is only for answering the question not for asking question. AWESOOOOOOOOME! Thank you so much!! Experts Exchange is a $$ driven company using the free effort of many experts (or people who call them selves experts) to get as many $$ as possible. Your reward are worthless "experts-points" and possible flames with other experts not wanting to lose these "points". I have created account successfully.. I tried, but it seems it's close. Is ther any other option to get the access? How to cancel the membership of experts-exchange of free trail. I need to cancel this.